Will Hutchins on Wayde Preston of "Colt .45" and Vampira (Maila Nurmi). Howdy! W. C. Fields said, “The best cure for insomnia is get plenty of sleep.” Some nights I lie sleepless in Long Island. I can’t count sheep, no room. Our house is so small that we have to Vaseline our cats. So I make up jokes in bed. I laugh and think backwards. I put myself to sleep. Here’s a knee slapper—An ol’ cowpoke went riding out one dark and windy day…in his Ford flivver—con sarn! His trusty Model T conked out on him. Along the dusty trail a Choctaw chief rode up on his pony. “Ugh!” grunted the chief. “Only good engine is dead engine.” You still awake? Speaking of W. C., my ol’ pard Kelo Henderson sent me a beautiful framed portrait of W. C. Fields as Micawber in “David Copperfield”. I had to move Dobe Carey’s picture over jes’a tad to make room for it down on my hideyhole wall. I have a photo of Kelo and the cast of his TV western, “26 Men”. He’s in the back row. They ran out of chaps. Kelo was my mentor early on. Taught me ropin’, fast mountin’, fast drawin’. Nowadaze, takes me a leetle longer to mount a hoss, but I can draw a gun in 3.7 seconds. Watch! Speaking of W. C., bravo Boyd! Your last edition of WC was a humdinger. What jolly memories you brought back of Wayde Preston. Whatta guy! Ever jet from Charlotte, NC to Asheville? Takes about half an hour. Seems like eternity—white knuckles all the way. Fingers and toes. I’m from L.A. I know earthquakes. Our jaunt was like an airquake. Lucky I wasn’t in the terlet. No seat belts. Wayde sat across from Babs and me. He took chucklesome delight in describing the horrors of trying to land during a dreaded wind shear factor. “You think this is bad? Once, I was in a small plane, just like this, in a storm. Suddenly, we were flying belly up!” Gulp! An airborne Poseidon Adventure! What a joy working with Wayde on the Canary Kid episodes of “Sugarfoot”. He never tried to be funny. He just was. Sneaky funny. Ol’ 20 takes Hutchins exceeded his limit when the two of us got to laffin’ and scratchin’. Hey, Boyd! Here’s a ‘Western Boo Boo’ to add to you collection. In “Trial of the Canary Kid” I was in disguise. I sidled up to Wayde in hopes of fooling him. Without looking up from his newspaper, “Hello, Tom Brewster,” says he. “Hello, Sam Colt,” says I. Yipes! You’d think somebody would have pointed out the Wayde played Christopher Colt! Me? I take no responsibility. Wayde’s real name was William Erskine Strange. Has a ring to it. I woulda kept it. 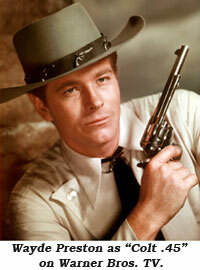 “Erskine Strange Rides the Range!” But what do I know? I tried to convince Warner Bros. to dub me Hutch McDuff. Wayde was sort of strange. He borrowed money from Warners and acted kinda reluctantish about paying it back. Wayde told us he was invited into a suit’s office. “Wayde!” barked the suit. “If you don’t give us our money, you’re dead in this town. And we’re not talking about your career! Wayde paid ‘em pronto. When you move on down life’s highway as far as I have, you leave more and more pals by the wayside. One day Al Jolson and his good buddy were driving past a cemetery. 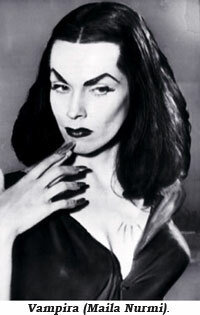 Al said, “You know, Sam, one of these days we ain’t gonna pass.” We lost Maila Nurmi awhile back. Born in Finland, the blonde beauty was a relative of the Flying Finn, Paavo Nurmi, Olympic Gold Medalist runner. She immigrated to Follyweird, put on a long, slinky black gown and a long, slinky black wig and garish makeup—presto! She transformed herself into Vampira, the first horror hostess in TV history. She parted the cobwebs and became a living-dead legend. Working with the Master of Macabre, Bela Lugosi, in the camp classic “Plan 9 From Outer Space” she was a natural; just his type—type 0. Maila was a vibrant spirit who wafted through my life from time-to-time. She was my date for my high school Class’ 10th anniversary party at the Roger Young Village auditorium in Griffith Park. We provided the eats, libation, dance band. She provided the thrills and chills for us earthlings. One evening a pal and I were tooling down La Cienega Blvd. We spotted Maila sitting on a bus bench. “Hop in, Maila—Where to?” “Oh, I was just waiting here for any friend to drive up and take me along.” We three drove to our favorite Mexican restaurant, El Cholo, home of the world-famous green corn tamale. Will Rogers said, “Never miss a good chance to shut up.” That was my m.o. in La Nurmi’s presence—her lore beat my lore. She was once married to a former child movie star of the silent flickers, Dinky Dean Riesner. He eventually penned some of my favorite “Sugarfeet”. She and James Dean were a happening part of the Hollywood night life scene. They had a tiff. She forbade his ever darkening her door again. So, he sneaked in through her window and stuck black crepe around the frame of his picture on her wall. The day Jimmy was killed, smashing his Porsche Spyder on a lonesome road, his picture fell off her wall—and smashed. Maila worked as a chorus girl in Mae West’s stage production of “Catherine Was Great”. Mae portrayed the czarina of all the Russias. Mae must have seen Fred Astaire in “Top Hat”. In the big song and dance number, “Top Hat, White Tie, and Tails”, Fred magically makes his cane a tommy gun and drills the chorus boys, his lightning toe-tapping emulating rapid fire. One-by-one, the chorus boys crumble to the stage. During a rehearsal Mae lined-up her bare-chested, heavily muscled hunks for close inspection. She walked slowly down the line, reviewing her troops. When she reached the end, she quickly wheeled around, pulled out a breast and became a one-woman firing squad. “Rat-Tat-Tat-Tat!” she yelled. She mowed ‘em down. A few years ago Maila sent me a long, sweet letter. I still have it. She ended, “I adore you. —Maila.” Wow! I wrote back post haste. I never heard from her again. Ah, Maila, Maila! She’ll be back. You know how it is with vampires—and Vampiras.